Engine power can be delivered to all front and rear wheels for maximum traction. Full-time 4WD is useful when extra traction is required on road, such as, when driving on slippery, muddy, wet, or snow-covered roads. These vehicles are not designed for challenging off-road use. Occasional off-road use such as established unpaved roads and trails is OK. It is always important when traveling off-highway that the driver carefully reduce speed to a level that does not exceed the safe operating speed for those conditions. In general, off-road conditions provide less traction and braking effectiveness than normal road conditions. The driver must be especially alert to avoid driving on slopes which tilt the vehicle to either side. These factors must be carefully considered when driving off-road. Keeping the vehicle in contact with the driving surface and under control in these conditions is always the driver's responsibility for the safety of him/herself and his or her passengers. WARNING - Off road driving This vehicle is designed primarily for on road use although it can operate effectively off road. However it was not designed for driving in challenging off-road conditions. Driving in conditions that exceed the vehicle's intended design or the driver's experience level may result in severe injury or death. mechanical noise or vibration. The noise and vibration will disappear when the 4WD LOCK mode is deactivated. Some parts of the power train may be damaged by prolonged driving with the noise and vibration. • When the 4WD LOCK mode is deactivated, a shock may be felt as the drive power delivered entirely to the front wheels. This shock is not a mechanical failure. drive mean all functions of your vehicle are exposed to more extreme stress than under normal road conditions. Slow down and be ready for changes in the composition and traction of the surface under your tires. If you have any doubt about the safety of the conditions you are facing, stop and consider the best way to proceed. Do not exceed the ability of yourself or your vehicle to operate safely. • When you are driving up or down hills drive as close to straight up and down the hill as possible. Use extreme caution in going up or down steep hills, since you may flip your vehicle over depending on the grade, terrain and water/mud conditions. • You must consciously take the effort to learn how to corner in a 4WD vehicle. Do not rely on your experience in conventional 2WD vehicles in choosing safe cornering speed in 4WD mode. For starters, you must drive more slowly in 4WD. Reduce speed when you turn corners. The center of gravity of 4WD vehicles is higher than that of conventional 2WD vehicles, making them more likely to roll over when you turn corners too fast. • Drive carefully off-road because your vehicle may be damaged by rocks or roots of trees. Become familiar with the off-road conditions where you are going to drive before you begin driving. Do not grab inside of the steering wheel when you are driving off-road. Your arm may be hurt by a sudden steering maneuver or from steering wheel rebound due to impact with objects on the ground. You could lose control of the steering wheel. • Always hold the steering wheel firmly when you are driving offroad. • Make sure all passengers are wearing seat belts. WARNING - Wind danger If you are driving in heavy wind, the vehicle's higher center of gravity decreases your steering control capacity and requires you to drive more slowly. • If you need to drive in water, stop your vehicle, set your transfer to “4WD LOCK” and drive at less than 8 km/h (5 mph). system, causing your vehicle to suddenly stall. If this happens and your vehicle is in a tilted position, your vehicle may roll over. • Do not drive in water if the level is higher than the bottom of the vehicle. • Check your brake condition once you are out of mud or water. Press the brake pedal several times as you move slowly until you feel normal braking forces return. • Shorten your scheduled maintenance interval if you drive in offroad conditions such as sand, mud or water (see “Maintenance Schedule” in the Index). Always wash you car thoroughly after off road use, especially cleaning the under side of the vehicle. • Since the driving torque is always applied to the 4 wheels the performance of the 4WD vehicle is greatly affected by the condition of the tires. Be sure to equip the vehicle with four tires of the same size and type. • A full time four wheel drive vehicle cannot be towed by an ordinary tow truck. Make sure that the vehicle is placed on a flat bed truck for moving. could lead to handling failure or rollover and serious injury. When replacing the tires, be sure to equip all four tires with the tire and wheel of the same size, type, tread, brand and load-carrying capacity. 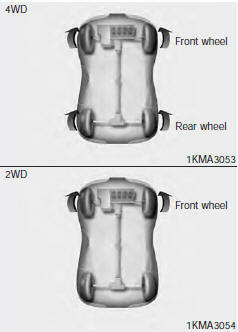 If you nevertheless decide to equip your vehicle with any tire/wheel combination not recommended by Kia for off road driving, you should not use these tires for highway driving. WARNING - Jacked vehicle While the full-time 4WD vehicle is being raised on a jack, never start the engine or cause the tires to rotate. There is the danger that rotating tires touching the ground could cause the vehicle to go off the jack and to jump forward. CAUTION - Mud or snow If one of the front or rear wheels begins to spin in mud, snow, etc. the vehicle can sometimes be driven out by depressing the accelerator pedal further; however avoid running the engine continuously at high rpm because doing so could damage the 4WD system. WARNING - 4WD driving • Avoid high cornering speed. • The risk of rollover is greatly increased if you lose control of your vehicle at high speed. • In a collision, an unbelted person is significantly more likely to die compared to a person wearing a seat belt. • Loss of control often occurs if two or more wheels drop off the roadway and the driver over steers to re-enter the roadway. In the event your vehicle leaves the roadway, do not steer sharply. Instead, slow down before pulling back into the travel lanes.